Israel has set up a special task force to prepare for the possibility that a locust swarm may migrate from Egypt and destroy precious crops. Already some sources are saying that a small swarm of locusts has been spotted in the southern Gaza strip after millions of locusts descended upon various Cairo neighborhoods over the weekend – including Giza, where the famous pyramids are located. “The locusts originated from breeding that has been in progress since November in southeast Egypt between Berenice and the Sudanese border,” according to the UN Food and Agriculture Organization (FAO) which has been monitoring the situation. “The locusts reached Cairo by flying on warm southerly and southeasterly winds associated with a low pressure system over the central Mediterranean,” according to the most recent report. The winds are expected to shift towards Israel and Jordan, which is why those countries are both on high alert. 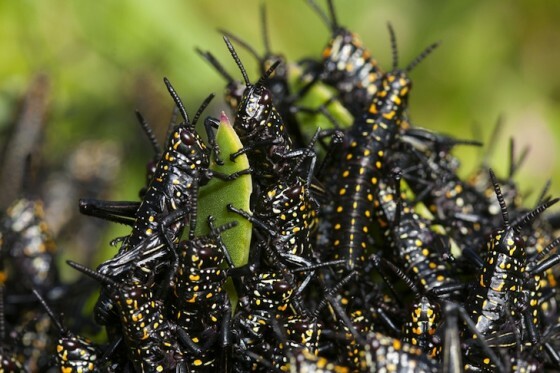 Israel has set up a special task force to deal with the locusts if they enter into Israel, and set up a hotline that farmers can call should they spot a “black cloud” of insects, which devour agricultural crops. The ministry has also contacted several suppliers of pesticides to ensure there is sufficient stock, though it is unclear how this would deter millions of insects. In 2004, the non-government organization Land Center for Human Rights reported that 38 percent of crops in Egypt were decimated that year following a historic swarm. Jordan is also bracing for a desert locust swarm, according to Ammonn News. The “Ministry of Agriculture is on alert and taking precautionary measures to combat the devastating bug, citing that it is in constant communication with the Desert Locust Combating agency in Egypt and the UN Food and Agriculture organization FAO,” the paper reports. Agriculture directorates in southern governorates are coordinating with exploratory teams dispatched to Ma’an, Tafileh, Aqaba, and the southern Jordan Valley region. The Jordan Armed Forces, Desert patrol, and the Public Security Department are all poised to join the fight.